Personal journey to only eat what I grow using Korean Natural Farming methods. This means using only natural inputs found right on our land. I focus on living soil and (IMO) indigenous micro-organisms. My son Drake tagged me on with this photo on Facebook. It isn't the most flattering shot, but it got me thinking that this photo captures what Korean Natural Farming is all about. Ya gotta get your hands dirty and dive into the whole experience. What I am doing is mixing one five gallon bucket of water into one 50 pound bag of Mill Run. Before adding the water I dissolved a heaping handful of IMO #2 into the five gallons. This is step #3 of a four step process. It is important to thoroughly mix the liquid into the dry Mill Run to get a uniform moisture content that won't drip when one presses it into a ball and the ball will break apart with a gentle finger poke. This creates the ideal environment for the microbes to grow. After I finish getting this pile mixed I'll cover it with an old cotton sheet. In about 48 hours this pile heats up so it is too hot to touch. The microbes are busy eating! The pile develops thick layers of mold. 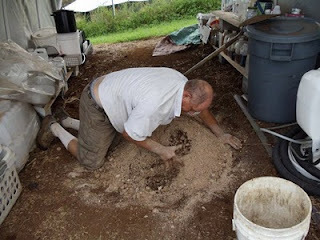 I turn the pile with a shovel every two days or so to cool it down and to mix all the microbes into the center of the pile. After 7 to 10 days the pile will be cool and I'll do step #4. Step #1 is to take several cups of cooked white rice and place it in a container about 3 inches thick. I use a shallow cardboard box about 9 inches by 12 inches. Then go out under a tree near you (preferably in your yard/neighborhood -- hence indigenous) and look for a pile of decomposing leaves. Gather some leaves at the bottom of the pile near the ground (you should see some signs of mold/white stuff) Break/sprinkle those leaves on top of your rice box, cover with a cloth napkin, and place into a dark closet for a week. Warning, you are growing a very colorful box of mold. Step #2 is to mix the stuff from step #1 together with raw brown sugar, 50% of each by volume. This is a hands on gooey experience (brings back wonderful childhood memories). Mix by hand, get sticky. Place all this goop in a ceramic canister and put a cloth lid on it. This is IMO#2! It will last years in a dark closet. Step #3 is what i did above. Step #4 is to mix an equal volume of dirt into the IMO#3 with a five gallon bucket of water to get proper moisture level for happy microbes. Cover and mix it like in step #3. In 7 to 10 days you will end up with IMO#4, the miracle magic of Korean Natural Farming. I'll explain how and when to apply IMO#4 in future posts. The fun is letting microbes do the work, they are the key to how nature works. E, Where did you get the IMO's from? I Live on a small island in the middle of the pacific and do not have access to 'mill run" or "wheat middlings" do you know of any alternatives to mill run that i could use? Yes, me too on the mill run! The Southern US isn't notorious for growing wheat. Cotton, soybeans, and corn, not wheat. Thanks for letting me know an alternative to the wheat! Love your tutorial! Blessings from Bama! i harvested my IMO after 5 days and mix it with molasses and after 7 days harvested for the second time...why is my IMO has molds on top. is it ok?